Bronze plaque on a wooden backboard. IN THE WAR OF 1939-1945 EIGHTY-TWO MEN AND WOMEN / FROM THIS PLACE SERVED WITH THE FORCES. 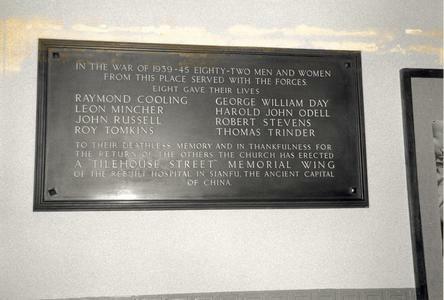 / EIGHT GAVE THEIR LIVES / (names) / TO THEIR DEATHLESS MEMORY AND IN THANKFULNESS FOR / THE RETURN OF THE OTHERS THE CHURCH WAS ERECTED / A "TILEHOUSE STREET" MEMORIAL WING / OF THE REBUILT HOSPITAL IN SIANFU, THE ANCIENT CAPITAL/ OF CAPITAL.